You know about my More than a Nut Milk Bags, and I've been so excited about my More than a Nut Milk Bag Recipe Collection that I've deluged you over the past months . . . but together, don't they make a perfect present to introduce adventurous cooks to the world of raw? Many of the food stores and specialty outlets that sell my bags think so, and have urged me to offer a "combo deal." It makes no sense to me to offer this through retailers without also letting my newsletter readers in on the deal, so here's it is: Two variants, a book and one bag, and, for those likely to take it seriously, a book and three bags. 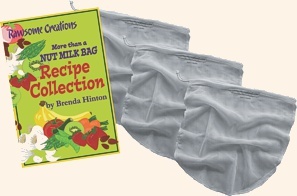 As you know, the book's a 112-page collection of my best raw food recipes, every one of which relies on a More than a Nut Milk Bag to prepare (take a tour of the book here). So by itself, the book only works for people already in possession of a bag. The Book + Bag Bundle for $25 includes attractive packaging AND free shipping from now until mid-December. If you use bags the way I do, one bag is never enough -- many recipes call for two or three bags! What useful little tools they are -- and for folks who have a serious raw on, the Book + 3 Bags Bundle is a welcome gift. Until mid-December, this Bundle is available for $35 including a pretty package and mailing to your address in the US. As always, a major part of this story is that a good share of the proceeds from sales go directly to our charities in Bali.